We didn’t heed our own device when refilling the pepper mill yesterday. The result: peppercorns all over the counter and floor. 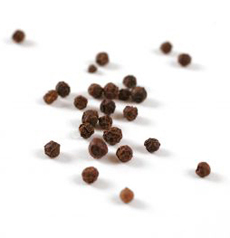 Fill a small plastic bag or even a paper envelope with the peppercorns. Snip off a corner. You’ll be able to better aim the peppercorns into the mill. Now that you’ve mastered filling the pepper mill, master all the different types of peppercorns. Find more tips like this in the handy book, Tips Cooks Love.